3 opposition fighters were assassinated in al-Harah, a town 47 km north of Daraa. Another 2 JAN fighters were assassinated in al-Sheikh Sa’ad, 24 km north of Daraa, and 4 others were kidnapped in al-Musayfrah, 22 km east of Daraa. All of these attacks were carried out by unknown assailants. IS launch an attack against SDF fighters in Zor Mghar, a village on the eastern Euphrates River bank adjacent to the Turkish border. 5 IS casualties reported. SAA and opposition forces clash in the vicinity of Khan Tuman, south of Aleppo. An SAA soldier and 2 women were killed by IS shelling of Jubb al-Jarrah, eastern Homs countryside. SAA clash with opposition forces in Tasnin, a village 16 km north of Homs. Fighting breaks out between SAA and opposition forces in Ter Maela, north of Homs. IS in al-Busayrah execute a young man from Tayyab al-Faall by shooting him in the head after charging him guilty of mocking Islam. Heavy clashes break out between SAA and IS forces in multiple areas inside Deir ez-Zor including al-Hawiqah, al-Roshdeyah, and the vicinity of Heart Hospital, on the Euphrates River in northern Deir ez-Zor. Local protesters against JAN from Ma’arat al-Nu’man set fire to a JAN HQ after releasing 4 Division 13 fighters held prisoner inside the compound. Tensions continue to rise in the area as JAN and Jund al-Aqsa arrived at Division 13 fighter’s homes in Khan Shaykhun to carry out further arrests against the opposition faction. Division 13 later released a statement accepting JAN and other islamist opposition faction’s demands to build a Shariah court house in Ma’arat al-Nu’man. Clashes break out between SAA and opposition forces in the vicinity of Maan and Umm Haratayn, northern Hama Governorate. Reports of casualties on both sides. Doudyan – Yani Yaban – Ghazl: IS vs opposition forces. Reports of casualties on both sides as opposition forces manage to take control over the village of Ghazl, 5 km west of Doudyan. ash-Shaddadi – Southern Hasakah Governorate: SDF vs IS. Kabanah – Jubb al-Ahmar – Jabal al-Akrad – Jabal Turkman – Latakia Governorate: SAA and allies under Russian supervision vs the 1st and 2nd Coastal Divisions, Ahrar ash-Sham, Ansar ash-Sham, JAN, and Turkestan Islamic Party forces. Reports of casualties on both sides. Kafarnabodah Vicinity – Northern Hama Governorate: SAA vs opposition forces. The number of opposition casualties since the beginning of the attack two days ago has reached 14. 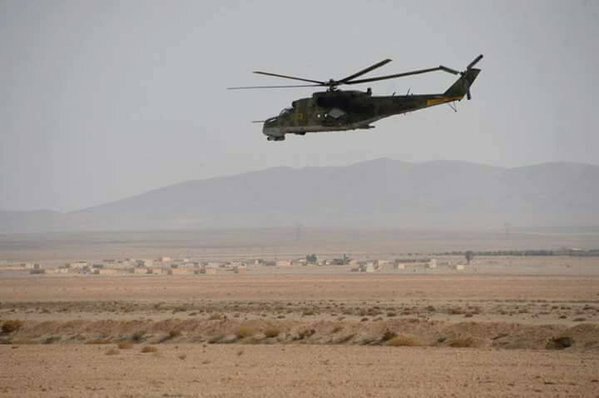 RuAF attack helicopter in Palmyra battlefront. Image courtesy of @islamicworldupd. Palmyra – Jazal Oil Fields: SAA vs IS. Reports of 6 IS casualties in addition to more casualties on both sides. More than 200 barrel bombs and artillery shells hit targeted Palmyra since yesterday in addition to 80 airstrikes. SAA advance in the area. al-Quaryatayn: SAA vs IS. Reports of casualties on both sides. Mneen – al-Tal: SAA vs opposition forces. Bala – Marj as-Sultan Vicinity: SAA vs islamist opposition and JAN forces.